USS Enterprise model from Sci Fi Museum not what it claims. 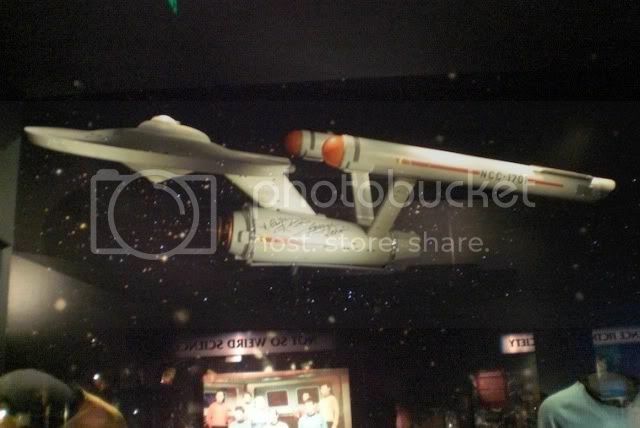 The 6' Enterprise model that has been on display at the Sci Fi Museum, allegedly from "Trials and Tribbleations" sold for $ 10,000 on eBay. However, it is pretty clear this model was never used in the episode. 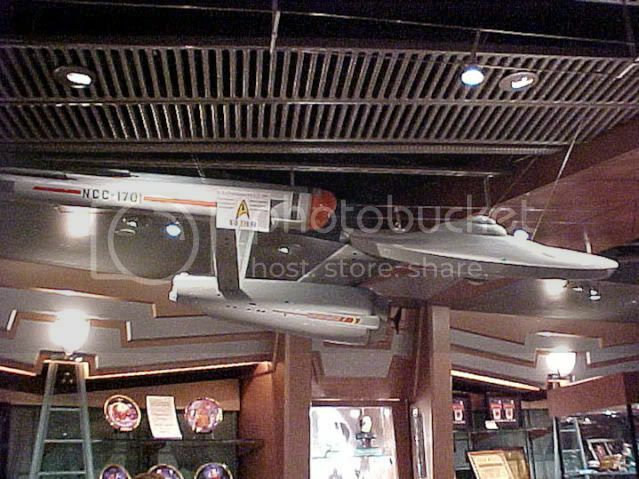 This was a model made for sale at Star Trek: The Experience. I have no idea how this seller claims this was used in Trials and Tribbleations. It clearly was not. Like the Jem Hadar Battleship that Profiles in History withdrew, this is not a screen-used model, but from the molds at best. And most likely, since Greg Jein built the original for that episode, not even that. 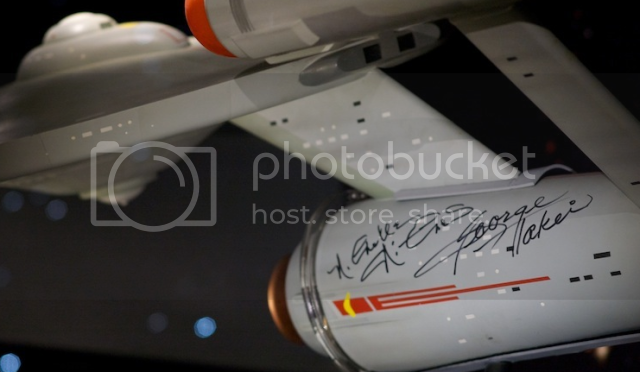 The owner had Nichelle Nichols and George Takei sign the model. Every collector who has ever seen this has cringed. Copies of the seller's original receipts only prove it is a souvenir! 1) Paramount didn't make the models for Star Trek. These were always outsourced to different model or prop shops, or in the case of the actual "Trials and Tribbleations" Enterprise, Greg Jein. 2) There is no proof this was in anyway used for "Trials and Tribbleations". 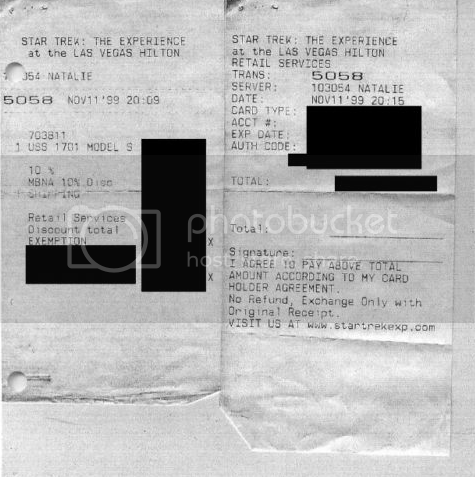 3) No actual screen used models were sold at Star Trek: The Experience. Some of these models may have come from the original molds, but none were ever screen used. 4) Paramount never let out models from Star Trek. They were almost all sold at the Christie's auction. The eBay auction ad can be found here. I am the first private owner of this genuine USS Enterprise (TOS) model that has been on display at the Seattle Science Fiction Museum for the part several years. The model was one of several built by Paramount Studios for the 1996 5th season Star Trek: DS9 episode "Trials and Tribble-ations"; which was produced as a 30th Anniversary tribute to TOS. It is approximately 6 feet long and three feet wide. It is not lighted. I personally had Leonard Nimoy and John Delancie sign the model in Las Vegas where I purchased it from the Star Trek Experience in 1999. I then had it signed by Nichelle Nichols and George Takei at the Science Fiction Museum. I am the person in the green shirt standing with them. I have included photos of the original receipt, the letter of loan and renewal and the insurance document from SFM. The model has always been professionally packed and will be shipped to the buyer in the packaging from the SFM - shipping will be via motor freight and will be billed at actual cost. There are minor scuffs in places, but overall it is in museum condition. This model was not used in the filming of the episode but was made at the same time in the same molds as the "hero" model that was lighted for the episode - that model is still in the possession of Paramount Studios. 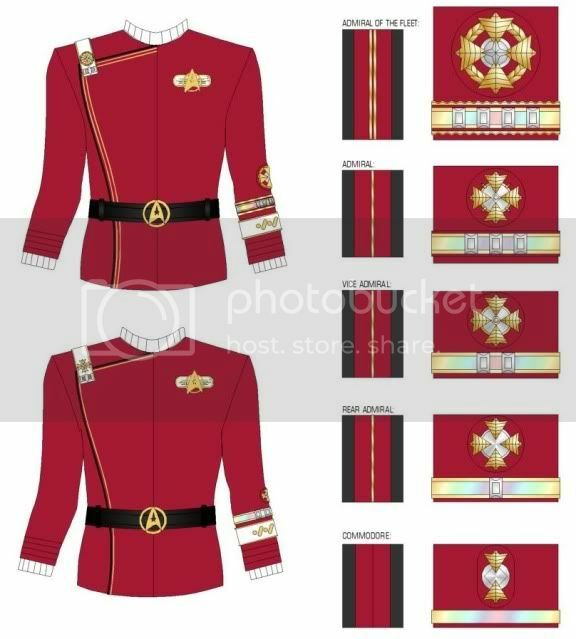 It's truly a unique collectible for the Star Trek aficionado. This may be the only opportunity you have to own a NCC-1701 model made directly by Paramount. Thanks to all on the Star Trek Prop, Costume & Auction Forum for their insight and thoughts! 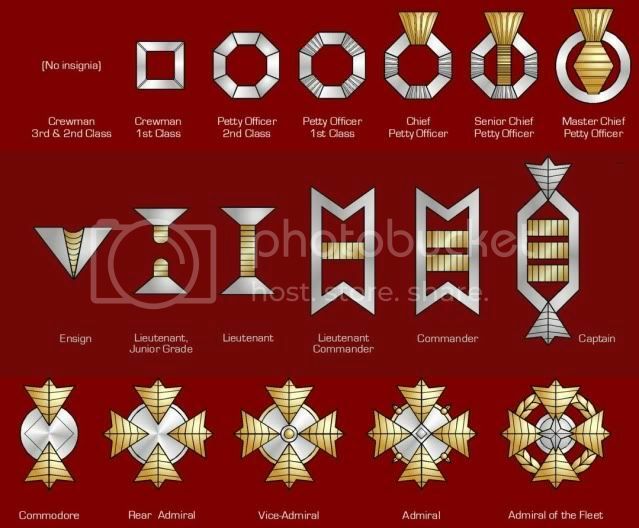 I found these two great images on Google and thought I would share them. They are a good guide to the Monster Maroon of Robert Fletcher. This is the last week for consignments for the Propworx Star Trek auction, scheduled for May. If you have any interest, please contact Jarrod@propworx.com. Jarrod is my right hand man when it comes to Star Trek and is the point person for all Star Trek consignments. Here are some of the great items in the auction, which will have about 200 items. 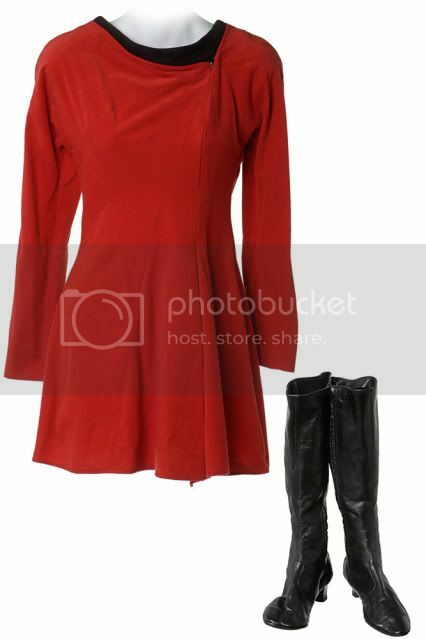 Celeste Yarnel's "Lt. Landon" Uniform from "The Apple" with boots! 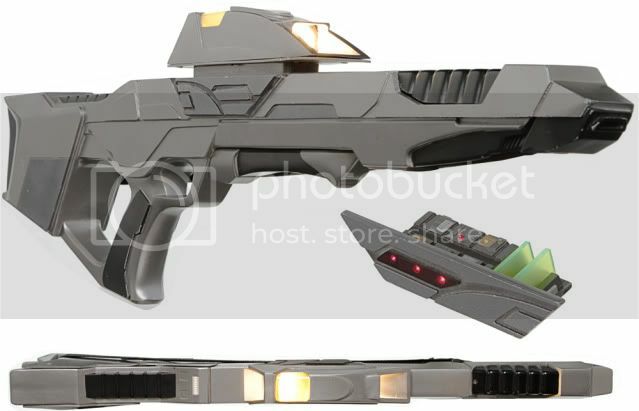 The Jem'hadar pistol was seen as an alien weapon as well (without the front cowl). This one is from my collection. 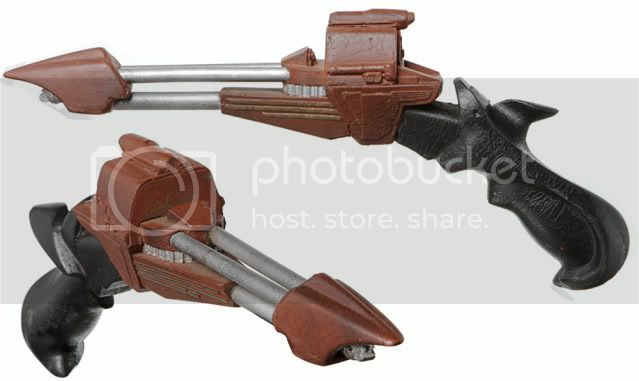 I also got the Jem'Hadar rifle from Profiles as well at the same auction. 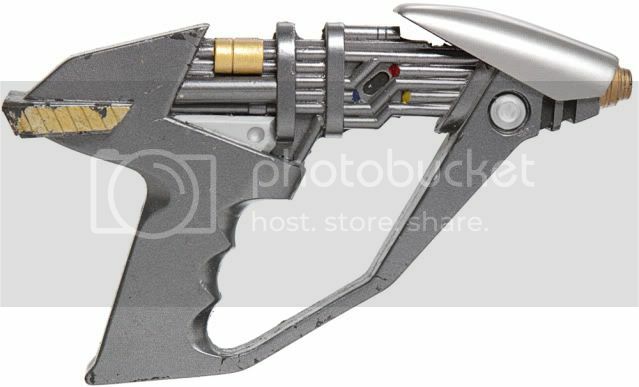 We see a lot of the Jem'Hadar pistol in "One Little Ship"
A close up of the pistol from "Tacking Into the Wind"
Lot 1515. 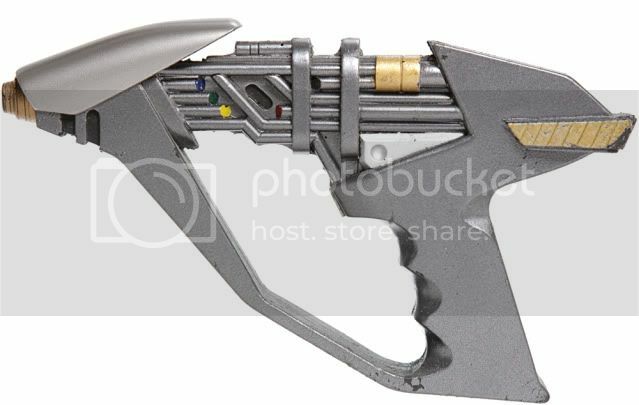 Hero Jem'Hadar Pistol from Star Trek: Deep Space Nine. (Paramount-TV, 1993-99) Cast resin pistol with vacuum-formed hood, painted grey with color accents. First used in the episode, "The Jem'Hadar," and subsequently used throughout the series. Built by HMS Creative Creative Productions and measures 9 in. long. 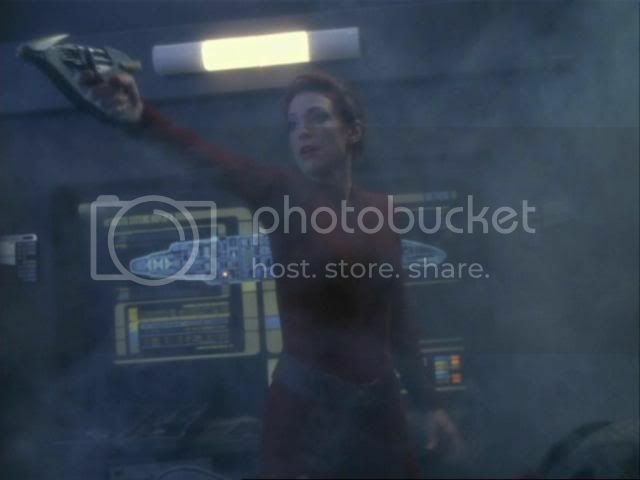 The Jem'Hadar pistol, in this incarnation without any modifications, appeared in three more episodes. 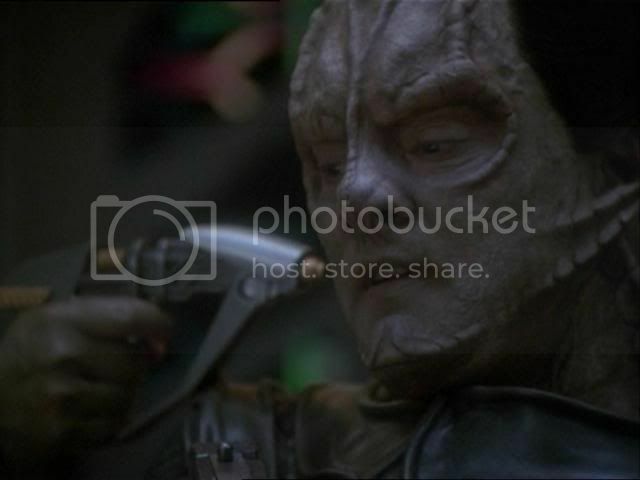 It was seen as a mirror universe weapon in "Through the looking glass" (used by Smiley O'Brien) and "Shattered mirror" (used by the Intendant). 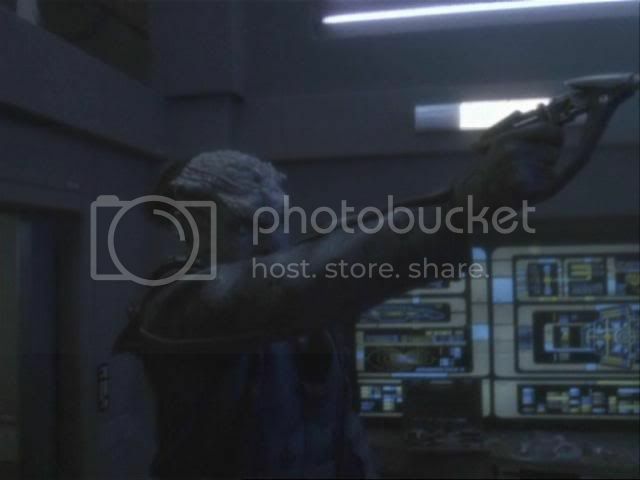 In "Marauders", two dirty Jem'Hadar pistols were seen as nondescript alien weapons.